If you’re a journalist and would like to interview our spokesperson, please contact Sharon McMillan, Director of Communications, at 416-932-9460, ext. 232 or by e-mail at smcmillan@ocsta.on.ca. Patrick J. Daly has been a Catholic school trustee for 31 years and has served continuously as Chair of the Hamilton-Wentworth CDSB since 1991. Prior to becoming a trustee, Patrick was the General Manager of P.J. Daly Contracting in Hamilton. Patrick was most recently elected to the OCSTA Board of Directors in 2010 and was elected President of the Association in 2016. Patrick and his wife Carol have 4 children and are parishioners at St. Ann’s Parish in Ancaster. For more than 85 years, the Ontario Catholic School Trustees’ Association (OCSTA) has dedicated itself to the promotion and development of the Catholic school system in Ontario. A major activity of the Association is to represent the point of view, the aspirations and the needs of Catholic school boards to the provincial government and, on occasion, to the federal government. Roman Catholic trustees elected by Catholic ratepayers carry out their role in a system founded on and nurtured by the convictions and commitments of the Catholic faith. The same distinction guides the Ontario Catholic School Trustees’ Association in providing services to its member boards. 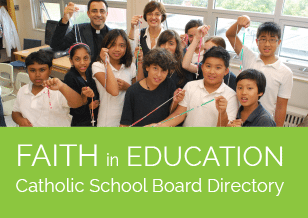 The twenty-nine Roman Catholic District School Boards that educate approximately 550,000 students and represent more than one million Catholic school supporters constitute the Association’s membership. OCSTA is managed by a Board of Directors consisting of 18 Catholic trustees elected from across Ontario. A professional staff, headed by the Executive Director, operates the provincial office. communicating with member boards on all these matters. monitoring on-going research regarding Catholic education. timely communications on all matters relating to education.